Tuesday morning before the show it occurred to me that my wife might have habitually left home with our good camera to take photos of our daughter's new apartment and her mother on her birthday. Sure enough the Lumix was half way to Albany. I considered asking her to FedEx it back to me, but realized mom was only going to have her 91st birthday once. Besides, I was soon going to need a replacement for my nearly decade-old Canon point-and-shoot with a mere 3.2 megapixels. After three visits to Rowe Photo, the premier camera shop in Rochester, New York, and four visits to Best Buy plus three nights of reading reviews on the Internet into the early morning hours, I finally settled on a camera that would work for audio shows, bicycling, mountain climbing, XC skiing and family vacations. Inexplicably, the price at Best Buy was $90 less than the price on their website. Who was I to argue? The knowledgeable young geek ran me through the functions and set it up for optimum show conditions. Only occasionally would I have to toggle between ISO 800 and 1600. There was no time to study either the camera manual or the website for the TAVES 2013 show. I walked into the King Edward Hotel with a blank slate in my mind and an empty 8GB chip in my camera. 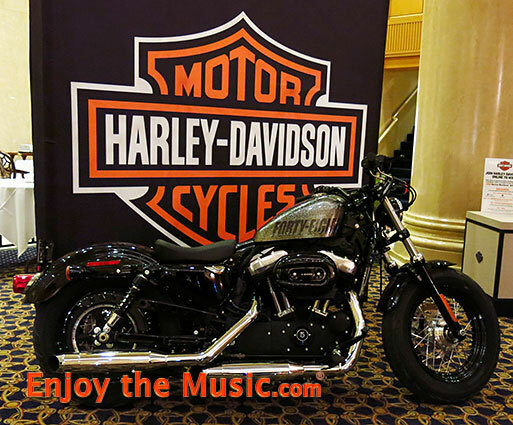 Greeting me in the lobby was a handful of Harley-Davidsons. Damn! If I had known I would have brought my helmet and gloves and taken the Forty-Eight Sportster for a test ride. The Hard Candy Chrome Flake paint job on the tank is among my favorites � and something high end audio manufacturers might consider to distinguish their product and raise the decorator acceptance factor. 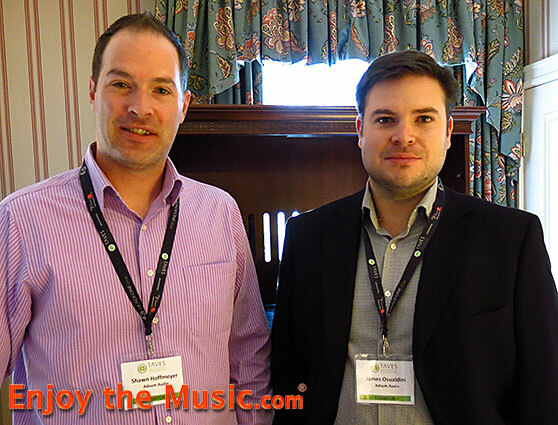 AudioScape of Canada took the approach of showing a lot of product their room. 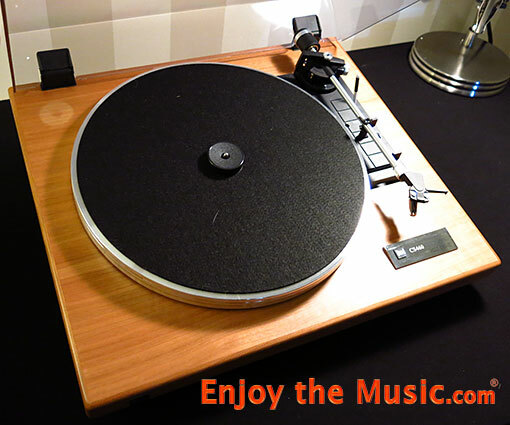 At the low end of the Dual line was the CS-440 fully automatic turntable at $449, yet offered at a show special price of $349. At the top end was the CS460-GB in gloss black... $999 list yet at a show special of $849, or in a handsome walnut finish shown here at $1099 or show special of $949. 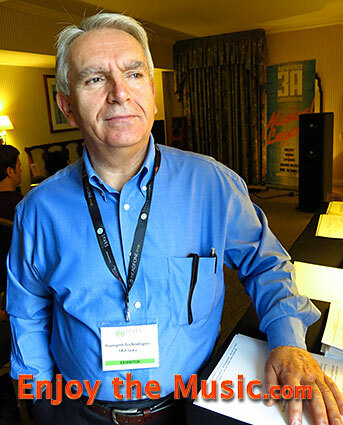 Also premiering at this show was a new affordable series of Usher speakers including a stand mounted monitor on sale for $2199 and Playing in the active rig was a Nottingham Space 294 turntable $3979 / $3189 show special that sounded very fine with some mid-line Mini Dancer Two Usher speakers, on sale for $4499, driven by a PrimaLuna DiaLogue Premium Integrated amplifier, everything connected with JPS Labs cables which I know from experience to be of very high quality. Kennedy HiFi from Markham, Ontario, was playing some PSB speakers in a modest system that was drowned out by the conversations in the room. It featured a T787 NAD AV receiver for $4200. Also spotted were some interesting Bluesound wireless speakers that looked to be wall mountable. 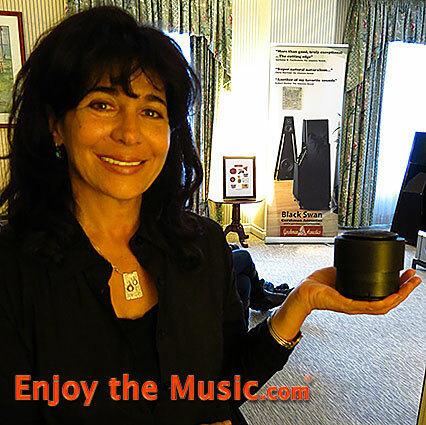 The Toronto Home of Audiophile hosted Ofra and Eli Gershman with both their Black Swan statement speaker that has grown to be consistently fine sounding over the years, and a much more affordable floorstander that I didn't get to hear at this show. While I've normally preferred the Black Swan with tube amplification, it was also exceptional driven by Pass Labs monoblocks here. 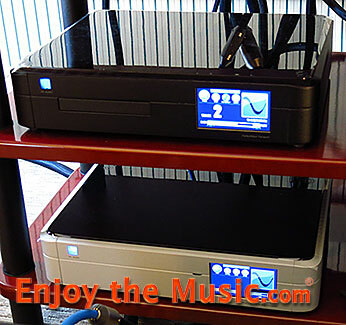 A Berkley Audio Two DAC alternated with a PS Audio PerfectWave DAC ($3995). I wasn't aware that the DACs were being switched, and didn't notice any difference in my casual visit to this room. Of special interest were the new Gershman Acoustics LVC Levitation Vibration Control footers utilizing magnetic repulsion and anti-vibration materials. A set of four large ones is $325 and four small ones are $299. It will be important to purchase the size that is appropriate for the weight of the component you intend to use with them. As good as these footers may be I noticed they were not using them in their big rig. David Cope of Audio Note UK was presenting an all-Audio Note system including the CDT Two transport, the 3.1X balanced DAC, the M2 line preamp, the Conqueror Silver 300B stereo amplifier and the E-SPE-HE speakers which he refers to as the alphabet soup model, strategically (and appropriately) placed in the corners of the room. 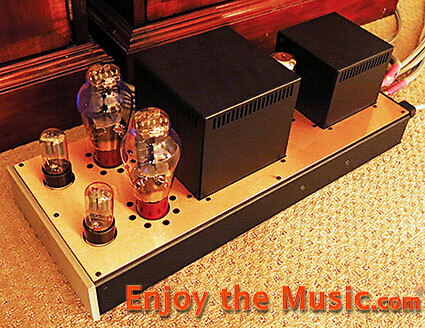 The 8 wpc of the amplifier was more than enough to drive the 97dB/W/m efficient speakers. 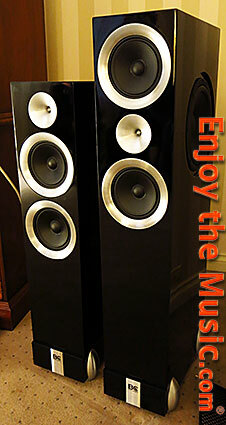 This gear habitually puts out gorgeous sound that never tires the listener. I asked David about Audio Note Kits, a company that markets kit versions and he said that they began marketing virtually identical products in kit form, but over the years they have strayed from the original products by making changes in the parts and the circuits so that today, they may have a product that strays significantly from the original Audio Note sound. 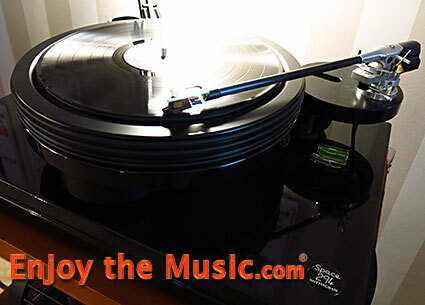 Having significantly transformed my Linn LP12 with off-the-shelf components, I understood his point completely. I encountered the Audio Note Kits room later in the show and I will have more to say about them. 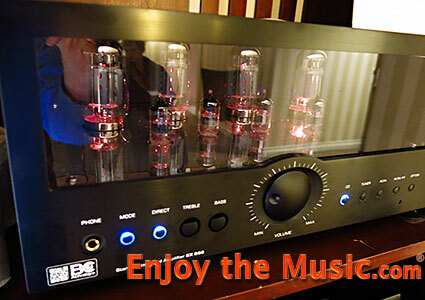 In the Import HiFi room I encountered the BC Acoustique line featuring the affordable tubed integrated amplifier I thought looked very nice at the Montreal show earlier this year. It was driving the BC Acoustique Act A2.1 speaker (4 Ohms, 91.5dB/W/m efficiency) and making good music at real world prices. 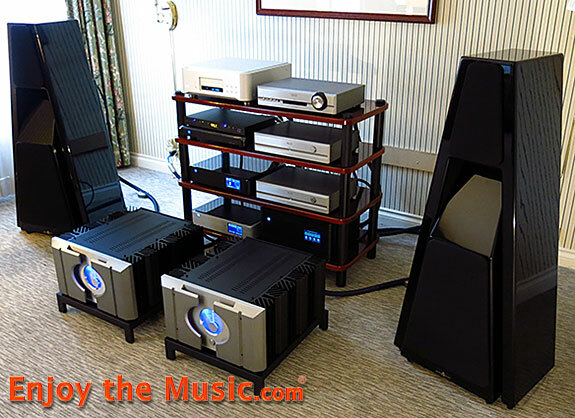 Adsum Audio from Edmonton, Alberta had a very fine lifestyle presentation with unique stand mounted monitors featuring a 4" high excursion mid/bass driver mounted in a cubical enclosure with a 4" passive radiator on each side to supplement the main driver. On top, in a telescope-like enclosure is a 0.75" dual ring dome tweeter. 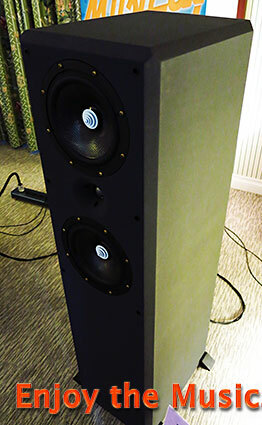 The $850/pr monitors can be supplemented with their $900 C4 subwoofer that appeared to be about one-foot cubed and featured clipped corners to match the monitors. The speakers were driven by a modest NAD T 557 Blu-ray Disc player and C 446 Digital Media Tuner feeding a large NAD integrated amplifier. The speakers come in white or black cubes and the tweeter tubes come in a wide variety of finishes, the most popular of which is the plywood finish shown here. Shawn Hoffmeyer and James Osualdini were enthusiastic about the success of their young company and for good reason. The sound is respectable and the design is unique without being ostentatious � perfectly sized for modest rooms and available with optional wall mounts if you have rug rats at lower elevations in your home. Plus, you get to choose your finishes, to a degree. 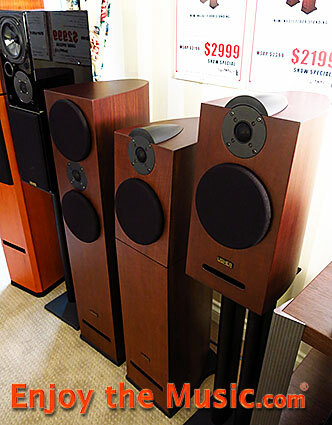 It had been a show or two since I heard Reference 3A loudspeakers so it was a very pleasant surprise to find Tash Goka and his wife Diane Koebel with their newest offering, the Nefes BE floorstander priced at $9950. Aside from the excellent sound of the rig, three things stood out. First, gone is the sloping front baffle of previous designs. Inside are a vertical brace and horizontal bracing that do not touch each other � in effect tuning the cabinet like an instrument. Second, the acoustic lens in the center of the mid/woofer drivers has more leaves than I remember, kind of like a honey dipper which cleans up the sound coming from the center of the driver. And third, the wood veneers are being phased out in favor of the dark gray Nextel finish that has superior acoustic properties and creates fewer inventory problems for the manufacturer and dealer alike. As much as I love a fine veneer finish, I appreciate the vanishing act of a dark speaker when listening in the dark. The Nefes BE (for Beryllium tweeter) was driven very nicely by the new Copland CTA 405 A integrated amplifier ($5990) in single bi-wire configuration. The ported speaker is good down to 26 Hz, I was told. Only an inch taller than the Grand Veena, and a few inches wider, the Nefes BE had more presence in the room due to its cubic shape and slightly larger footprint. This also gives it a bit more sensitivity at 92dB/W/m and it is likely a bit more tube friendly at 8 Ohms. 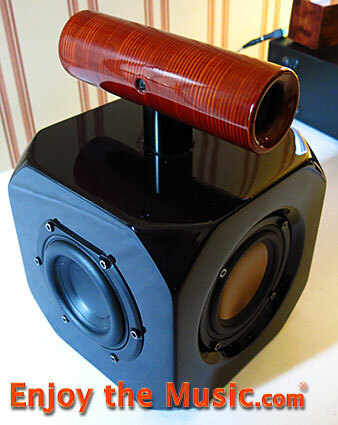 Yet the sound is quite familiar, not deviating from the holographic musical signature of other 3A speakers. For those with really large rooms, there is the Sema model above the Nefes. I dropped back to this room several times and was always captivated by the music here.